Okay, we’re not like Thelma and Louise at all, but every spring and fall for the last couple of years my mom and I hit the road for Virginia so she can visit her sister. My aunt lives in a tiny town about an hour from Richmond and at least 30 minutes from wifi. I stay in nearby Farmville, a charming town with history, beauty, and wifi to spare. I get a lot of work done here. Mom and I had hoped to see some fall color on the trees in Virginia, but they are almost as green here as they are back home. So I decided to look for other sources of color to share with you. Here’s a little bit of what I found. Farmville, a historic city in many ways, is home of Green Front Furniture, a conglomeration of historic warehouses throughout downtown that are filled with high-end furnishings and home décor—800,000 square feet worth. These brown and rust-colored boards cover the hole where a tall window used to be in Warehouse #7. 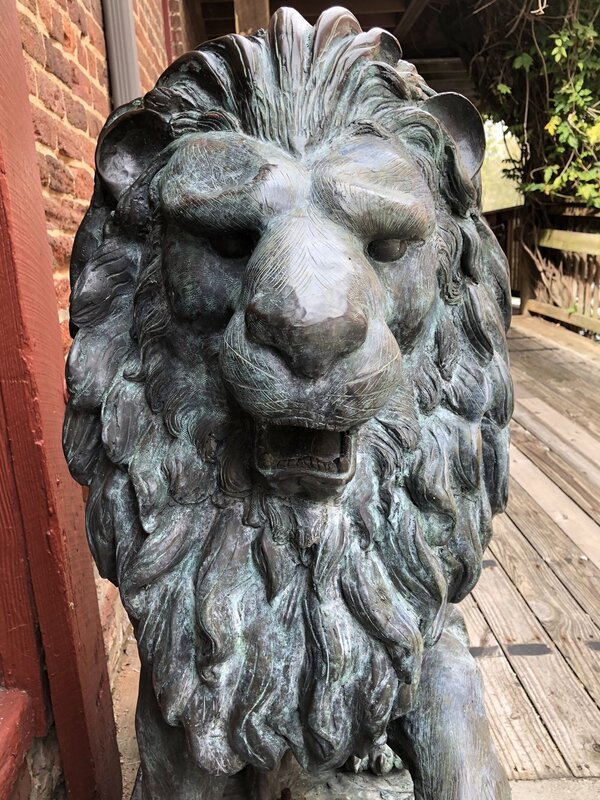 A verdigris lion stands guard, along with its twin, on the ramp leading up to Charley’s Waterfront Cafe (home of the best she-crab and roasted red pepper bisque I’ve ever had). Look at the detail in the lion’s face and mane. He makes me think of CS Lewis’ Aslan of Narnia. Pink, orange, and yellow lantana not only attracts butterflies, it also attracts me. I want to plant some next year. This grouping of beauty stands against an old brick building in the corner of a parking lot. 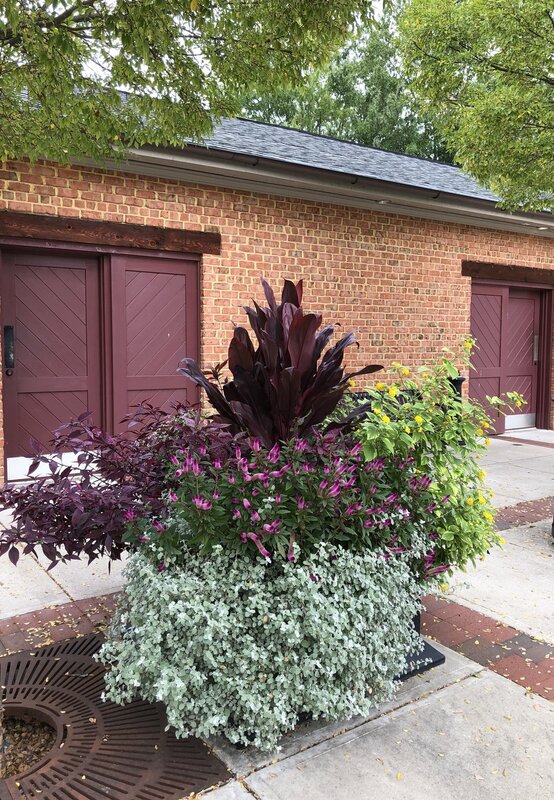 Who knew that plants could coordinate so beautifully with restroom doors? A red caboose is even more brilliant on a cloudy day. Wish I could hop aboard. The red trim on the windows and doors of the warehouses draws my eye to their vintage quality. This green bicycle marks the start of High Bridge Trail, a railroad line that was converted to a hiking and biking trail that runs over the Appomattox River. This cloud seems to be following the rooflines of the warehouses below. No matter what time of year it is, the colors of the sky are always in season. What is your favorite color of fall? Let me know in the comments below.